2012 was a year dominated by many things. The Italian cruise liner ‘The Costa Concordia’ ran aground causing 32 deaths, Usain Bolt became the first man in history to win the 100m and 200m sprint in back to back Olympics, the USADA stripped Lance Armstrong of his seven Tour De France titles, Barack Obama was returned to the White House for another term of office and the world waited with baited breath to see if the Mayan Doomsday Prophecy would see us all enjoy a last meal on December 21st. I have a friend who was so convinced a biblical flood was coming that he moved into the mountains and began stock piling supplies. On the evening of December 20th, he phoned me and raised a toast to life as we knew it. We said we’d meet again in greener pastures and, I have to say, I hung up with an inexplicable sadness as if any of it were true. On the morning of December 22nd, I drove across the country to see my son as I did on weekends. The dreaded hour passed and my friend called. He had been toasting through the night and he was in a heap. He told me he had lit candles and simply sat there drinking and waiting for the end. We were still alive, the world would go on and he was absolutely dejected. There were those who believed that, in some sense, the world would end today following the conclusion to ‘The Fight of the Century’. One fighter would lose and an era of boxing would end. Floyd Mayweather and Manny Pacquiao didn’t simply have fans….they had followers. Amir Khan has fans, GGG has fans, Keith Thurman has fans but Mayweather and Pacquiao had legions who had shared their journey through the good times and the bad. In some small way, the faithful of these fighters had grown old with them and two decades had elapsed as we watched their rise to a place where only truly elite could stand….a place that was home to just two fighters in this generation, Floyd Mayweather and Manny Pacquaio. This morning, one of those men would pack away his mementos and souvenirs and hand over his keys. That man is Manny Pacquiao. The fight that was so many years in the making was a disappointment when it came. To say nothing significant happened over the 36 minutes would be to flatter the event but Floyd Mayweather showcased his skills in a way that Pacquiao did not and no one can look to Kenny Bayless of the judge’s ringside for an excuse to challenge the outcome. Surprisingly, there are many who felt that Pacquiao won on aggression. Skip Bayless and Evander Holyfield have gone public with their views but aggression only counts when it’s followed by punches and Pacquiao was short on effort even if it were only to catch the judges eye. Floyd stayed out of trouble, threw a decent jab and landed with shots on such a rare occasion that I can’t actually recall any but I know that he did. The disappointing aspect of the fight is that he did just enough as Pacquiao looked fiercely reluctant to engage. I gave it to Mayweather by 116 – 112 and he wakes up today with a record of 48 – 0. So where do the fighters go from here? When Danny Garcia schooled Lucas Matthysse, some felt that it was the end of the road for the tough Argentinian but he has managed to re-establish himself and talks of a rematch are certainly viable. Fighters come back from defeat all the time and Pacquiao has done it more than once but there is an element to the May/Pac saga that transcends all other rivalries in the modern era. Whereas fighters like Matthysse and Garcia seek to simply win titles and coin a reputation, Floyd Mayweather and Manny Pacquiao moved way beyond that ambition some years ago. With ‘Fighter of the Decade’ and ‘Fighter of the Year’ accolades draped upon them, belts meant little and the focus of the entire boxing world for the past 7yrs was to get these men to face each other. There were great fights with De La Hoya, Cotto, Hatton, Margarito, Mosley, Canelo, Bradley and JMM but these bouts simply wetted the appetite for the fight the world wanted to see and every outing from both men just fed into that potential showdown. The culmination of all these years, all the fights, all the training and all the talk is now over and Floyd Mayweather stands alone. For Floyd, there is another road ahead. Rocky Marciano’s record is hanging there like a ripe apple and all he has to do is pluck it from history. He has announced that he will vacate the belts in the coming weeks and no one can blame him. Titles are no more than an inconvenience to Mayweather now and the governing bodies’ demands that he face mandatory challengers would only succeed in dulling the bigger picture. Floyd will decide who he will face and I honestly believe he has earned that right. He has been to the mountain, he has beaten the man and he will go out as he sees fit. More power to the guy. Like him or not, he is a phenomenon and it will be generations before we see another to challenge his place in boxing folklore. For Manny, the future is not so lined with glory. Had he beaten Mayweather or ran him close, there would surely be a rematch but I don’t think the appetite is there and Floyd has nothing to prove anymore. Pacquiao will not command PPV numbers again as the world followed on the hope of seeing a fight that we have now seen. I can’t believe that even Bob Arum and Top Rank can rally enough support for a bout with Jessie Vargas or even against the likes of Thurman or Khan as a victory would mean little and a title would be hollow. The last decade of boxing was about two men and, to quote a line from the movie ‘Highlander’, “There can be only one”. That ‘one’ is Floyd Mayweather and Pacquiao has given to boxing all that he is ever going to. I suspect retirement will be on his lips today and, should that happen, the proud Filipino, ‘The Typhoon across the Pacific’, has given us excitement, magic and far too many memories for words to ever capture. He has made our hearts race and the passion that he brought to the ring will make us smile every time we look back. Boxing owes him its gratitude and I would take this opportunity to thank him for the great years he granted to fight fans like me. I only hope that he can give to the people of the Philippines, all of the heart and soul that he gave to the people who follow this game and we now look to Floyd Mayweather to go and take his rightful place in annals of boxing history. Next boxing news: Svensson reflects on WBC World title defeat: ‘’I made a mistake and that cost me the fight! 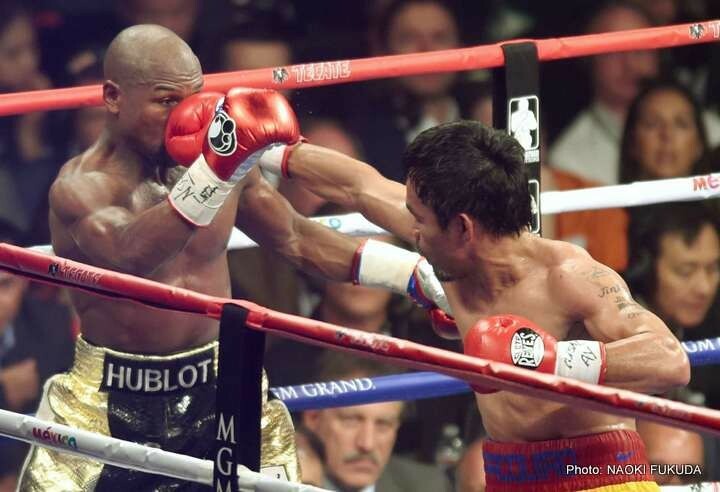 You are here: Home / Boxing News / Mayweather vs Pacquiao: Where next?